Fishing season in Patagonia extends from November to April; We offer you this complete report on one of the most important tourist centers in the mountain range area. This article can suggest you all fishing alternatives along with appealing excursions for the Patagonia traveler. And at the end of springtime because of the melting of the ice they come down with much more water… and fish! A land plentiful of water means a fisherman’s paradise. And that is just what you are going to find in Esquel and its surroundings. To the north is the National Park Lake Puelo and the beautiful lake Puelo where you find many species of Rainbow Trout and also Brown and Stream Trouts. Lake Epuyen offers the chance to get good size specimens of Rainbow Trouts. The principal secondary rivers are also good places for fishing: Río Azul, Río Turbio, Río Epuyén and Río Puelo. At this latitude but further into the steppe we find the Rio Chubut with its low waters, stone bottom and crowded with fish. Lake Cholila in this same area has the so wanted locked salmons. Exactly further to the west of Esquel, we find National Park Los Alerces where you can get the most assorted species, surrounded by an exuberant, amazing view. An incredible chain of lakes and rivers make up the system of this Park: Lago Rivadavia, Río Rivadavia, Lago Verde, Río Arrayanes, Lago Futalaufquen, Lago Krugger, Río Stange, Río Frey, Río Futaleufú, Lagunas Larga and El Martillo, among others. Further to the east we get to the famous spring creek Arroyo Pescado and the rivers Corintos and Nant and Fall, along with lagoons Willmanco and Zeta. Certainly here you will not miss anything since there are many species, sizes and styles for your fishing. Going south you will find the areas of Río Pico and Corcovado, according to some fishermen the best ones for trout in all Patagonia. The mouth of Rio Corcovado into the Lago Vintter offers the best world-class Stream Trouts. We should also mention the lakes Del Engaño and numbers 1, 3, 4 and 5. Finally, a bit to the south, Lake Plata (one of the most beautiful in the area, surrounded by lengas forest) has Fontanalis Trout as its principal species. Click here to access a comprehensive Chart of Species, Environments and Fishing modalities. – In order to fish in any of Patagonia’s environments it is absolutely essential to carry a fishing license, which is personal and intransferable and must be shown along with the national ID of the bearer. categories and values which are only valid to fish in the jurisdiction that issues them. – Always, you either hire it or organize it yourself, a fishing day must be within daylight hours. 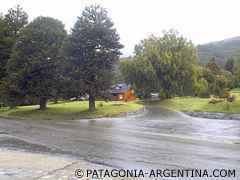 – In the rivers and streams all over Patagonia, salmons cannot be sacrificed so all of them must be freed after capture. The same thing is for regional species such as perch, Patagonia silversides, catfish and puyenes. – In the lakes and lagoons there is a restriction about the number of pieces which generally is a trout per each fisher. You can never sacrifice the species “locked salmon”. If you wish to find out how to get there, where to stay, distances, etc… please click here. A Chart of Species, Environments and Fishing modalities is available for your convenience. To find out more about Esquel and its tourist attractions, please follow this link.